A decade after his punt block symbolized a city’s recovery, a retired football pro with ALS is immortalizing himself in film, to be remembered by his child. Ten years ago, when the New Orleans Saints returned to the Louisiana Superdome for the first time after Hurricane Katrina, one play defined the game. Just 90 seconds into the first drive, Saints safety Steve Gleason blocked an Atlanta Falcons punt attempt. His teammate recovered the ball for a touchdown, and the Saints went on to beat their division rivals by 20 points. Many fans saw the play as a signal of the city’s post-hurricane comeback, and Gleason earned celebrity status in New Orleans. On the fifth anniversary of that famous game, Gleason announced his amyotrophic lateral sclerosis (ALS) diagnosis. Doctors had confirmed his condition earlier that year, just six weeks before his wife, Michel Rae Varisco, found out she was pregnant. Steve Gleason of the New Orleans saints. Also known as Lou Gehrig’s disease, ALS is a neurological condition that destroys nerve cells and ultimately causes disability. As the disease progresses, it impacts the muscles used to move, eat, speak and breathe. According to Mayo Clinic, respiratory failure is the most common cause of death for individuals with ALS, and that typically happens approximately three to five years after diagnosis. Some patients prolong their lives with a tracheostomy, where surgeons create a hole in the neck and equip the individual with a respirator that inflates and deflates the lungs. 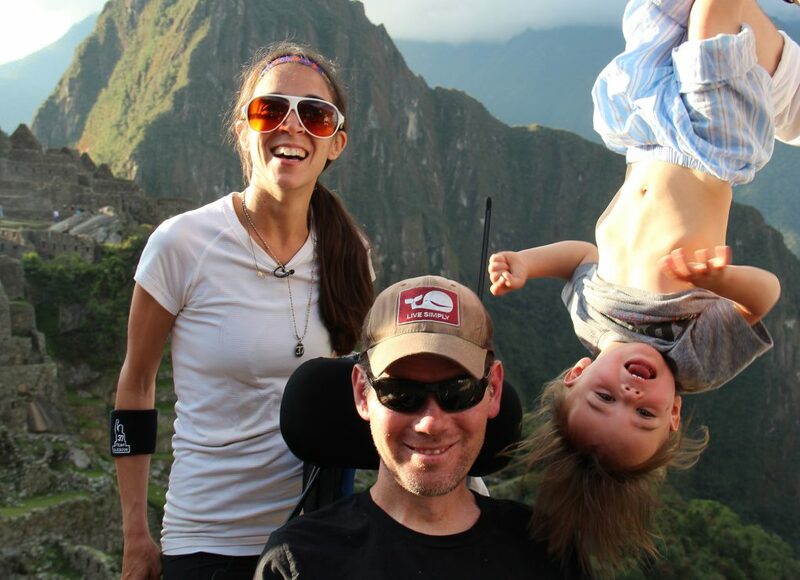 After Gleason’s ALS initial diagnosis, he and his wife regularly recorded video diaries for their child–and, in the process, chronicled four years of Gleason’s physical decline. From that footage comes the documentary, Gleason. Following a 2016 Sundance Film Festival premiere, it was released on DVD this month and will be available on Amazon Prime Video in December 2016. That’s Steve Gleason. He marches to the beat of his own drummer. Deeply personal and poignant, the film follows the family through Gleason’s diagnosis and the developments that follow. It documents the desperation the former professional athlete feels as ALS paralyzes his body; it also spotlights the challenges that Varisco faces as a partner, caregiver and new parent. But, optimism shines through, as well. From the birth of their son, Rivers, to lessons on living in the moment, to lighthearted jokes in even the most physically awkward situations, “Gleason” is a story of joy and hope. 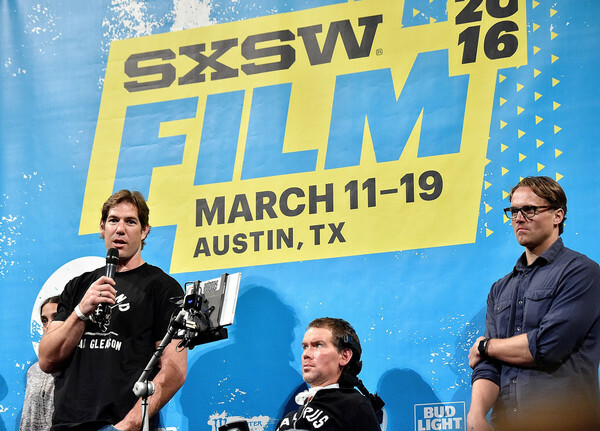 Scott Fujita, Steve Gleason’s former teammate and close friend, was a co-producer on the film. The two first met during an off-season training session, shortly after Fujita signed with the Saints. Steve, his wife Michel Rae Varisco, and upside down baby. The pair played together until Gleason’s 2008 retirement, and stayed in touch after Fujita’s career took him to the Cleveland Browns. He was back in New Orleans for a game against his former team when Gleason first mentioned that he was experiencing unexplained muscle spasms. The symptoms sounded uncomfortably familiar to Fujita, who’d lost an uncle to ALS 15 years earlier. 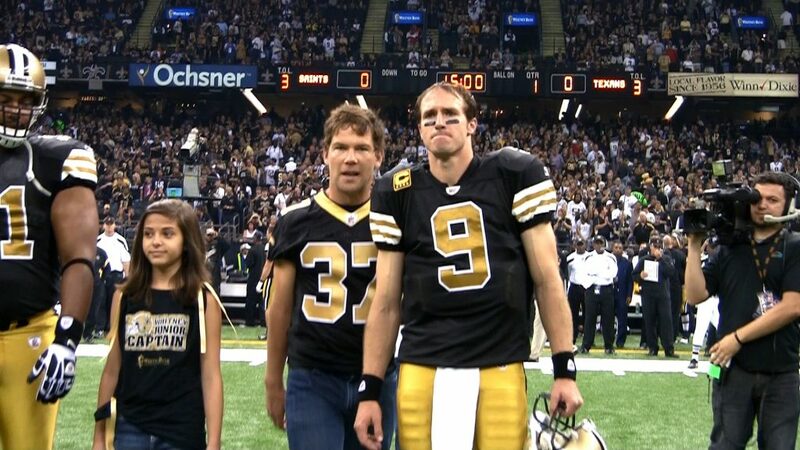 Within a few months, doctors confirmed Gleason’s diagnosis. “I remember where I was standing at the very moment Steve called with the news. I knew it was possible, but it didn’t seem real until I heard the words coming out of his mouth,” says Fujita, who also remembers Gleason’s pledge to keep ALS from destroying his life. Steve and friend Scott Fujita debuting Gleason at SXSW. Just days after the diagnosis, Fujita, Gleason and a few friends completed a sunrise trek to the top of San Francisco’s Twin Peaks. Weeks later, Gleason and Varisco set off on a driving tour through Alaska. On the one-year anniversary of his diagnosis, Gleason went skydiving to raise money for Team Gleason, the nonprofit he founded to empower individuals living with ALS. In the months that followed, he and his family attended national sporting events, hosted fundraisers and even traveled to Peru to hike Machu Picchu. 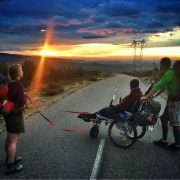 A 21-member group organized through Team Gleason included Rivers Gleason, then just 18 months old, Michel Varisco and two ALS patients in wheelchairs. Fujita was among the friends and caretakers who carried Steve Gleason’s chair up the rocky trails. Throughout all those adventures, the cameras were rolling. Plans quickly crystallized, however, once Varisco learned she was pregnant. “Steve said, ‘If the experts are right about the timeline, and I only have two or three our maybe four more years to live, I need to share myself with this unborn child right now.’ That’s when he turned the cameras on himself,” says Fujita. For about two years, Gleason and Varisco filmed video diaries intended only for Rivers. When they decided to share their story with a wider audience, they enlisted the help of director J. Clay Tweel. He and his team sorted through more than 1,300 hours of footage to create Gleason, including clips shot by filmmakers who lived with the family once Gleason could no longer hold a camera. Tweel’s 110-minute documentary incorporates scenes from the family’s travels, daily activities, doctor visits and personal discussions, plus perspective from their friends and family. Steve Gleason also directs monologues to his son, sharing fatherly advice on everything from building campfires and skipping rocks to spirituality and dating. Additional clips document Gleason’s difficult conversations with his own father. 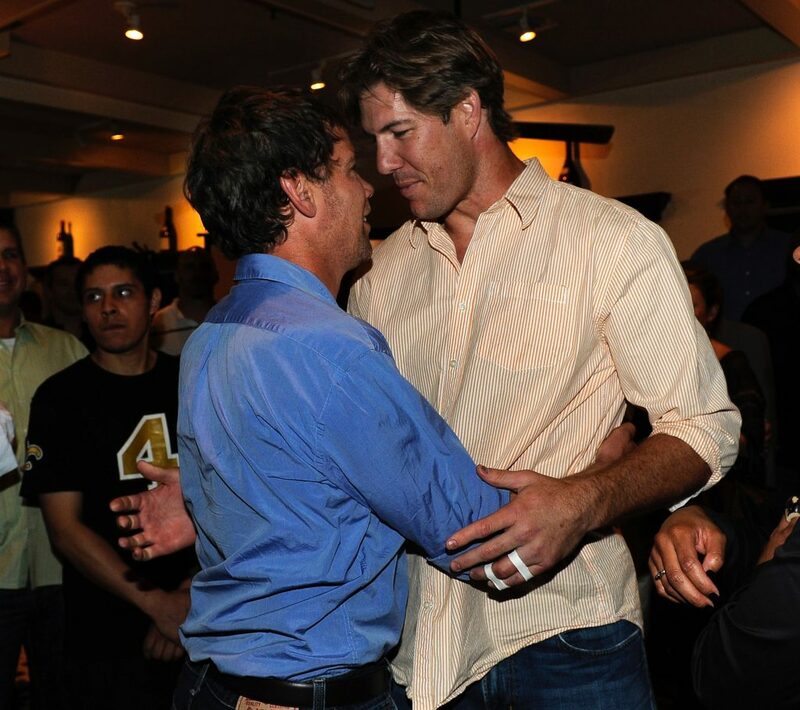 Steve hugs Scott Fujita at a Super Bowl Ring Party, thrown in 2011 in Steve’s honor. Gleason and Varisco talk candidly about their fears and feelings throughout the film. In one particularly moving scene, Gleason struggles with the fact that he can no longer speak. Thanks to that sort of intimacy and honesty, the documentary offers an intensely powerful look at the impact of ALS. Fujita attended several screenings of “Gleason” this summer, and participated in a number of post-film discussions with audience members. The themes that resonated with viewers touched on topics ranging from parenting to strengthening relationships to using art as therapy. Varisco, who started sketching to ease anxieties and pass the time while waiting in medical offices, sold some of her pencil drawings at a Sundance Film Festival event and now shares her art in an online gallery. At one screening event, a father stood up and said the documentary had inspired him to reconnect with his estranged son. At another, a room filled with ALS caretakers, patients and family members gave Varisco a standing ovation for bringing attention to their unique challenges. Elsewhere, nurses expressed a renewed sense of purpose. A candid moment with Steve and his family at home. “One woman stood up and said, ‘I want to thank Michel for humanizing my patients. Tomorrow, when I make my rounds, I’ll remember that they are not just a number on a card,’” Fujita says. At one screening, a viewer asked Varisco what she wanted people to take from the film. “I hope people get whatever they need,” she said. 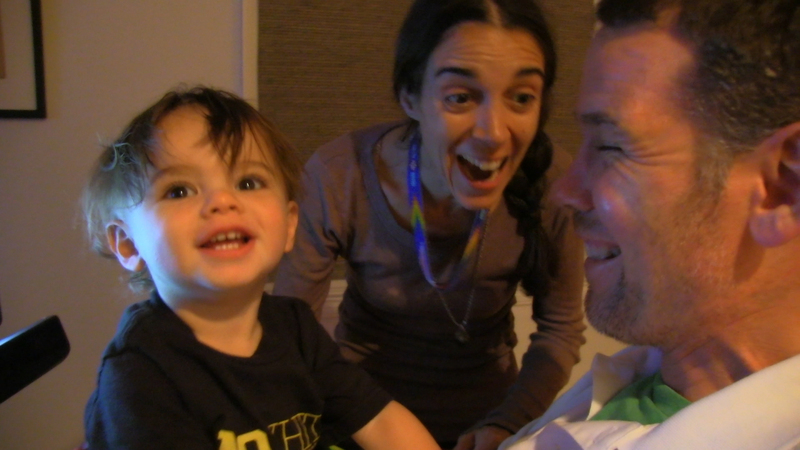 Steve Gleason continues to inspire those who view the film and hear his story. Nearly seven years after his initial ALS diagnosis, he breathes with a ventilator (he opted for a tracheostomy in 2014) and uses eye-tracking technology to communicate from his wheelchair. A team of caregivers assists Varisco and Gleason on a daily basis, and his physical decline has mostly stalled. “I believe my future is bigger than my past,” Gleason says. Gleason attended a few screening events held in conjunction with this summer’s film release, sometimes joking about buying tequila shots to help viewers through the intense scenes. He remains involved in Team Gleason, raising funds for ALS awareness and research, and he advocated for the Steve Gleason Act signed by President Obama in 2015. The bill makes vital communication technologies available to ALS patients on Medicare and Medicaid. Gleason also continues being an active father to Rivers, who turned five in October. And, this fall marked 10 years since the retired football star blocked the post-Hurricane Katrina punt in New Orleans. Early in his namesake documentary, Gleason makes a statement that could easily double as a tagline for his life, the film and his current attitude, as an individual living with ALS.